These are the fine looking Rotarians who were expecting to walk on the COLDEST NIGHT on February 20th. It turned out to be almost the warmest night for the winter. Well done team Rotary. 12 walkers raised $2,400 so far. It is not too late. If you have not donated yet please click on the link below. Hi Rotarians of Whitby & Brooklin! Our team, Rotary Club of Whitby (incl. Brooklin), will be participating in the Coldest Night of the Year on February 20th! Would you join the team to walk and raise lots of cold, hard, cash? 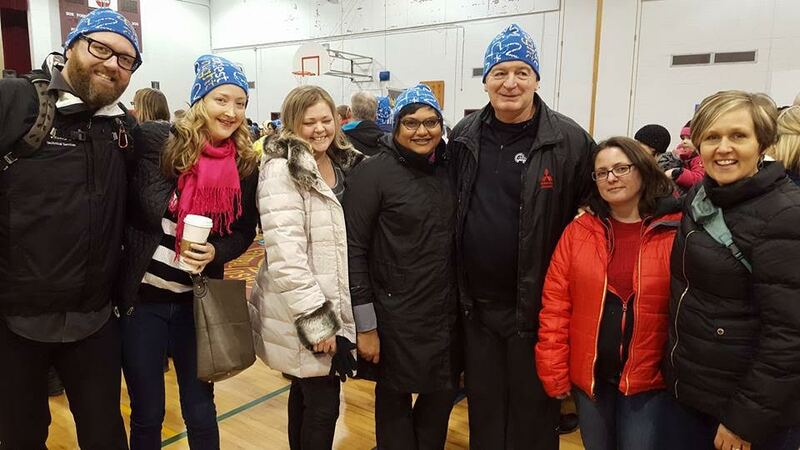 The Coldest Night of the Year is a Canada-wide winter walk-a-thon to support local homeless ministries in each participating city. It's a fun and chilly event, and it provides much-needed support and awareness for homeless organizations that often face a decline in funds during the coldest months of the year. Our team will be raising funds and walking for The Refuge Youth Outreach Centre. Would you join me and our team? We need people who can wear a toque well, and you fit the bill. Click the link below, which will take you to our team page. From our Team Page, click on the "Join Team" button to register. P.S. You can follow the WALK on Facebook here!